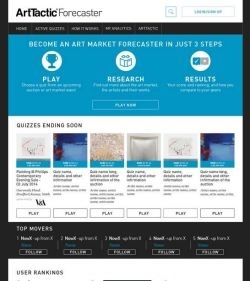 Welcome to ArtTactic Forecaster – a new addictive art world competition. ArtTactic Forecaster is an auction quiz game that earns you points and player rankings based on the accuracy of your predictions for art coming up for sale in ‘live’ auctions. Join a rapidly growing global community of players, consisting of art professionals, collectors, art enthusiasts and students. In the next few minutes I will take you through some of the key features of the game.